Increased running speed and added other tweaks to help building new characters faster. Updated for the Forgotten Gods DLC. Updated for the Forgotten Gods DLC. Experience penalty when player level is higher than monster level has been removed. Faction points from monsters has been increased to 10 times higher. Almost all magical and rare items have both prefix and suffix now. Cap of Devotion has been increased to 166. Now it's more worthwhile finding all of the shrines. Installation: Unzip to Steam\steamapps\common\Grim Dawn\mods\. 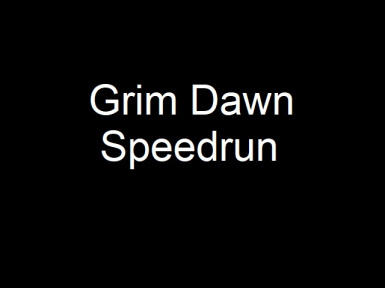 In custom game, choose speedrun. Cunning and Spirit attributes now grant correct amount of bonus health. This change is retroactive on existing characters. Changed Cap of Devotion to 166 in the main branch to match the shrines added in the Forgotten Gods DLC. Cap of Devotion in the normal progression branch remains 55.